" Hangman's Tree Historic Spot - C 1959 - Placerville, California. " 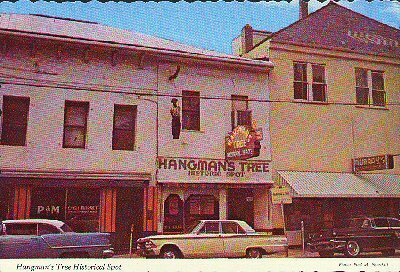 (1692) POSTCARD: Hangman's Tree Historic Spot - C 1959 - Placerville, California. -Condition: Very Good.- Not Posted. Colored photo of building with three wonderful vintage cars parked in front. States on the back that the stump of an old oak tree known as Hangman's Tree was there. Price: $3.00 + shipping.